Understanding the success of any app is tied directly to quantifying the value of its user base. 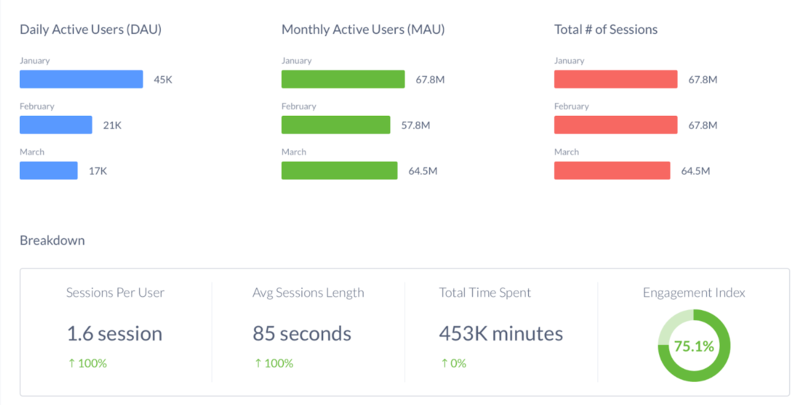 Our Engagement page lets you get a deep understanding of active users, session volume, and total time spent in app. Quantify the dollar value of millions of apps by understanding the total monetizable time users spend in app. Analyze key engagement metrics like DAU, MAU, Session, and Session Length for any mobile app in the store. Track the trend of these KPIs over time and see how they breakdown county by country.